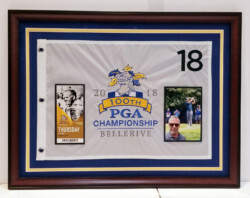 Frame Your PGA Golf Flag for just $159.95! Includes mat, frame, UV glass and finishing. Add photos or tickets for additional $20.00. Pictured flag has additional matting, not included.